This unique Galet Secret has strong symbolic value and combines technicity with playfulness. Under its guise as a classic strap watch is hidden a very ingenious mechanism. Developed from the tourbillon double spiral movement, this patented complication allows for two sapphire glasses to rotate 240 degrees downwards, very much like a closing fan, revealing the dial. The dial itself is a marvel of hand-made grand feu enamel, combining subtle colours of beige, green and gold, depicting an imperial dragon, fabled animal in chinese astrology. 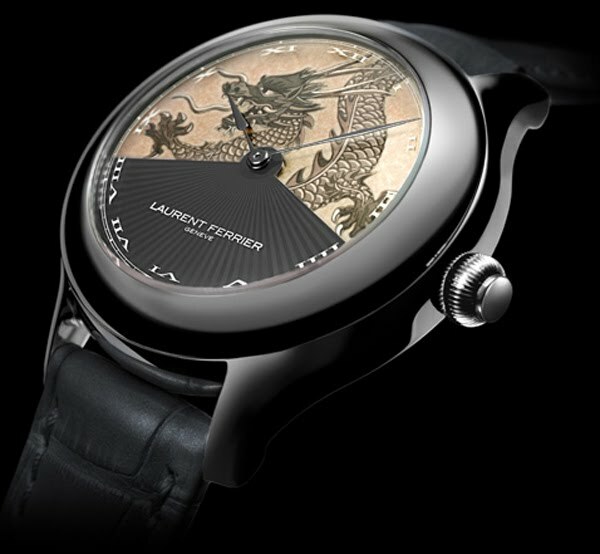 Unlike any other dragon, Laurent Ferrier was intent to create a unique image, one that could not be found in any books nor any chinese temples. Thus after lenghty research and numerous attempts, the dragon depicted compliments in every respect the unique nature of the Galet Secret.